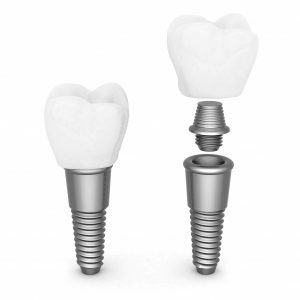 Implants look similar to a screw, and can have different diameters and lengths. Implants are made of titanium – the material with the best durability and biocompatibility. Our clinic offers patients a lifetime guarantee for implants. Implantology is a dynamically developing area of dentistry. 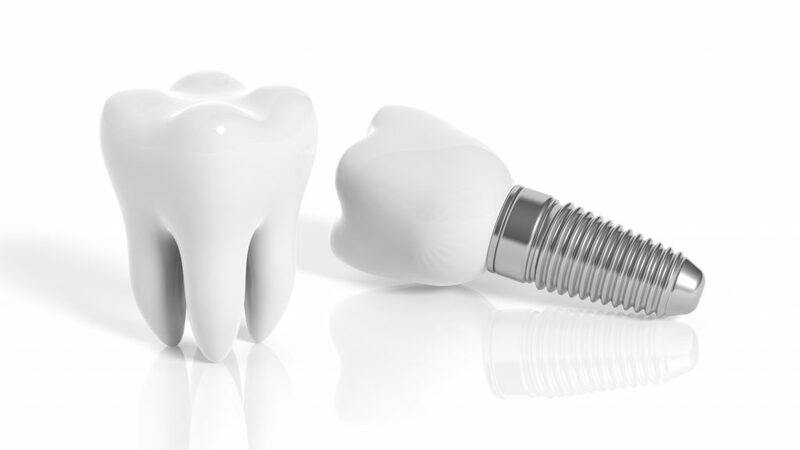 Based on many years of research and experience, implant manufacturers have developed their own implant systems. In addition to various types of implants, these systems include specialist tools and devices, healing screws, crowns and bridges. An implant system also involves special surgical techniques and dedicated prosthetics. The main objective of any implant system is to achieve excellent results of implantation. What distinguishes individual companies is the durability and quality of the final outcome of implantation. Our clinic uses only a top-quality implant system from the renowned and world-famous German-Swiss company Camlog. Every implant company offers various types of dental implants of varying constructions, diameters and lengths. It is up to the implantologist to choose a particular one. This choice is determined by anatomical conditions inside the mouth, patient’s capacity and expectations and many other factors. As long as there are indications for implantation, the wealth of different types of implants will always allow the doctor to pick the right model. deficiencies which have been replaced with a removable denture, and the patient wishes to replace them with a permanent denture. Implantation is recommended for patients who have lost their teeth due to decay, periodontal diseases and mechanical injuries. The loss of even a single tooth leads to many changes in the upper or lower jaw. One of these changes is bone loss. Atrophy is the consequence of the lack of mechanical load on the bone, e.g. when chewing. Shifting and loosening of teeth adjacent to the missing tooth space is another pathology. Healthy teeth are subjected to increased loads, which makes them more susceptible to damage. The only effective method to prevent bone loss following tooth loss is implantation. a guarantee of beautiful smile for many years. We offer a lifetime guarantee for implants implanted in our clinic, something only a few implantologists are entitled to do. Preliminary appointment, at which the patient discusses his or her expectations and the doctor performs a general assessment of the teeth. The implantologist also takes medical history. Detailed tests which help the implantologist assess the condition of the teeth, periodontium, toothless areas and soft tissues. X-rays or CT scans are also performed (if necessary). Additional tests – if doubts about the patient’s condition arise after medical history and tests, the implantologist may order blood tests and additional tests. Treatment options, as well as medical recommendations for the patient to observe during treatment are discussed with the patient. At this stage, the doctor also presents the exact cost estimate for the treatment, depending on the particular treatment method chosen by the implantologist and the patient. A schedule of the implant-prosthetic treatment is set and the patient signs consent for the procedure. Mental preparation for implant surgery is an important element of therapy. It increases the patient’s sense of safety, improves the comfort of doctor’s work and has a positive effect on the final effect of the treatment. The doctor talks to the patient, discussing the full plan of treatment with details of each stage and makes sure to dispel any doubts or fears. Very often, these are about pain felt during and after surgery. From our experience and based on our patients’ opinion, we can say these are completely unfounded. Medicine has made great progress in the area of anaesthesia and pain management. The time when the administration of an anaesthetic had an overwhelming effect on the patient is long gone. With the modern devices, we can administer the medicine in a completely painless way. In case of more complicated procedures or in patients with a particular sensitivity to pain, treatments are performed under sedation (the so-called moderate analgesia). This kind of anaesthesia can only be performed by a specialist in the field – an anaesthesiologist. Medicines the doctor administers intravenously in the course of sedation include painkillers, which will keep working in the post-operative period. Local anaesthesia with The Wand system or sedation. Preparation of an implant bed using piezosurgery and a set of drills matched to the specific size and type of implant. This requires the implantologist to have an exceptionally steady hand and a “sense of the bone” which is gained with experience. Introduction of the implant – another stage requiring extreme precision, which determines the final success of the procedure. Modern medicine offers many methods of fighting post-operative pain. Post-implantation pain is normally easy to control. Implantation procedure is carried out in an environment with physiological conditions almost completely preserved (gums and periodontium). The mouth and its tissues are prepared for the procedure by the doctor, which means they are free from any inflammation. Pain is therefore only a consequence of intended surgical activity (traumatisation of tissues) limited to a minimum thanks to the use of specialised tools and equipment (piezosurgery and specialised drills). After the treatment, pharmacotherapy with NSAIDs (such as Ibuprofen) is usually sufficient. The drugs must be administered as prescribed by the doctor. There are, of course, “stronger” painkillers which you can reach for after consulting with your implantologist. In most cases, implant placement procedure is less burdensome and less invasive than simple tooth removal. Implantation procedure does not require a longer stay in the clinic. Scientific research shows that 98.9% of implantations are successful. If substrate for implant placement is insufficient, preparatory procedures are necessary. If bone loss has occurred, bone needs to be rebuilt. Already three months after the extraction of a tooth bone conditions within the upper and lower jaw change, so it is a good idea to get an implant as soon as possible. extension of bone base by RIDGE SPLITTING. Implant treatment is absolutely the best method of replacing missing teeth. Unfortunately – just like with any surgery – there are some contraindications to implantation. If suitable treatment is undertaken or the patient is willing to change his/her lifestyle, implantation can be carried out.